Please note - chair not included! This product is just the versatile mesh back support shown above, with a tri-tension attachment to fit your existing chair. 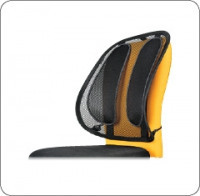 This Fellowes Mesh Back Support helps to reduce tension associated with extended desk work by gently moulding to your body's contours. This helps in providing uniform support across your entire back and alleviates aches and strains. Suitable for use on most chairs, the tri-tensioning attachment provides a fixed, secure position and the mesh design allows air flow for increased comfort.